The traditional music of Botswana is a rich form of art. CD's are quite profitable! National Music Eisteddfod in Selebi-Phikwe. GET THEIR CDs, either wholesale by the dozen or by the hundred. 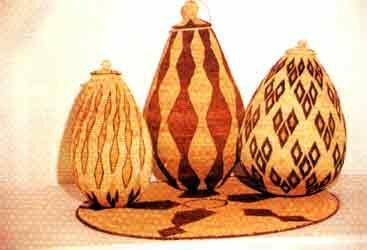 The other forms of rural Botswana art are displayed in the various baskets crafted by the village women from Mokola palm and local dyes. Thamaga Pottery and Oodi Weavers are the other notable artistic communities of Botswana, who have contributed to the art of Botswana for years. USE "GOOGLE IMAGE" on these words, take a look at the designs. 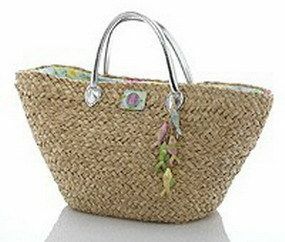 Imagine what a purse made of such a well woven basket would bring in EUROS or DOLLARS. Imagine a Kalahari pot or design on a pillow or shawl or tapestry The money that such a RARE ITEM would bring in NYC, PARIS or LONDON. Have you seen the prices that one American dealer gets for a few INDIAN THINGS? She is MARLA MALLETT . A small HINDU cotton purse is 400$. An AFRICAN TEXTILE of cotton can be a thousand dollars! SET UP your own trade route, you who read this. From India to NYC. From BOTSWANA to PARIS or LONDON or SWITZERLAND. FIND THE BOUTIQUES via CRAIGS LIST. DESIGNATE your agents in EUROPE, NYC, BEVERLY HILLS, HOLLYWOOD OFFER things that nobody can get! KALAHARI DESIGNS. Better than Picasso!! And ole PABLO gets $l00,000 for a bowl of simple French clay Pottery. THE SAN PEOPLE did that kind of art and STILL COULD. Now, you can't pull their art off the desert rocks but you can get those people in Botswana to create it on baskets,bowls fabric, ceramics, plaques. and make it look much the same those people can draw like their ancestors l0,000 years ago. Sell it in Germany Paris, London. You get the money from many small shipments of art to build a BIG life. MANY SMALL trades a dozen things here, a hundred there, add up. EVEN relatively inexpensive things like BASKETS. a PURSE SHAPE with a longer handle for putting over the shoulder, a stronger handle to carry it through the streets of New York, in your hand. I wonder what they cost per piece, there. by the dozen there. Incredible workmanship. BUY l00 of them. BUT REDESIGN them more like the COACH BAG BELOW. What would the artisans charge? Could a village even MAKE l00 of them? THIS COACH BAG IS PROBABLY A THOUSAND BUCKS. WHY NOT COPY the LINES but with BOTSWANA WEAVE and DESIGN? Our POSTER is ANITA SANDS HERNANDEZ, Los Angeles Writer, Mother of 4 and career Astrologer. 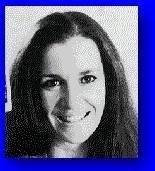 Catch up with her websites TRUTHS GOV WILL HIDE & NEVER TELL YOU, also The FUTURE, WHAT'S COMIN' AT YA! FRUGAL LIFE STYLE TIPS, HOW TO SURVIVE the COMING GREAT DEPRESSION, and Secrets of Nature, HOLISTIC, AFFORDABLE HEALING. Also ARTISANRY FOR EXPORT, EARN EUROS...* Anita is at astrology@earthlink.net ). Get a 15$ natal horoscope "my money/future life" reading now + copy horoscope as a Gif file graphic! No smarter, more accurate career reading out there! <=== BACK TO ENRON PLANET, the DOOMSDAY SCENARIO! Coming again soon so be ready with your cottage industry!